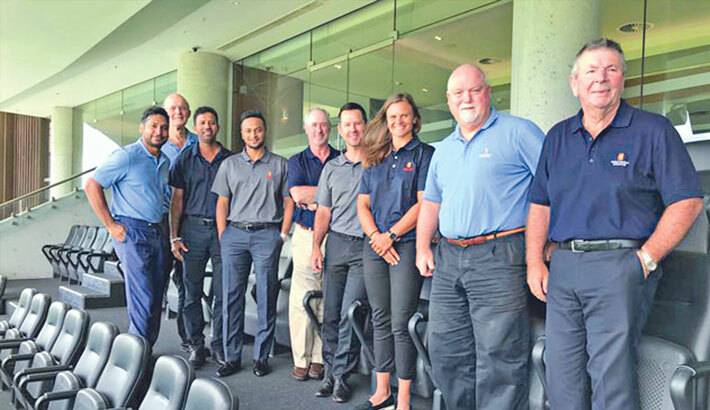 Bangladesh Test and T20 skipper Shakib Al Hasan, fourth left, are seen along with other members of MCC World Cricket committee at Sydney Cricket Ground in Australia. Shakib became the first player from Bangladesh to attend MCC meeting on Wednesday. The MCC World Cricket committee met at Sydney Cricket Ground on Tuesday 9th and Wednesday 10th January to discuss a number of topics ranging from the future of Test Cricket to the MCC Laws of Cricket, reports Lords.org. It was the first meeting attended by Shakib Al Hasan, Suzie Bates and Kumar Dharmasena, who joined the committee earlier this year while Mike Gatting, chairing his first meeting, thanked David Peever, Chairman of Cricket Australia, and Kevin Roberts, Executive General Manager of Cricket Australia, for addressing the committee during the meeting. Shakib Al Hasan, the first player from Bangladesh to sit on the group, and who was attending his first meeting, addressed the World Cricket committee by giving his view on a range of issues affecting the modern player. Shakib’s experiences contrasted with those of Jonny Bairstow, who spoke to the committee at the July 2017 meeting, and highlighted that the choices facing a modern professional vary greatly from country to country. Shakib described how his greatest honour is representing his country, but the financial incentives do not match those available in global domestic T20 tournaments. He was concerned that many younger players, who don’t share his view of wishing to play Test cricket for a long period, will prefer the shorter format of the game that is more readily available and offers more financial security than playing longer-form cricket. It is a hard choice for players in some countries to make, and the committee feels it has created an imbalance in the international game. Former star captain of Australia Ricky Ponting also supported Shakib’s point of views. “We’d love to see the ICC get more involved in making sure the money goes where it should go - to players,” Ponting said. ► Rewarding players properly is vital to the future of Test Match cricket. ► Test Championship key to help safeguard the future of Test cricket. ► BCCI strongly urged to support cricket in the Olympics. ► Player associations should become more involved in reporting of corruption. ► Women’s cricket must seize momentum following successful World Cup. ► Better educational materials needed to highlight dangers of concussion. ► World Test Championship requires standardisation of DRS technology. ► MCC to review overseas tours strategy to maximise support for developing nations. ► Suspending play in extreme heat is within the Laws. ► The next meeting of the MCC World Cricket Committee will take place at Lord’s in August 2018.